At a signing ceremony today, Norway committed a US$3 million contribution to the Farm to Market Alliance (FtMA), an initiative of a group of agri-focused organizations formed to make markets work better for smallholder farmers. 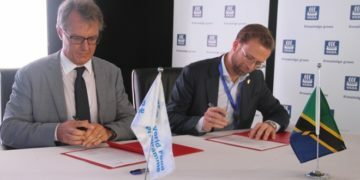 The Norwegian support was announced during a visit of Nikolai Astrup, Minister of International Development of Norway, to the Yara Tanzania Fertilizer Terminal in Dar es Salaam. The contribution marks the first year of a strategic partnership between Norway and the Farm to Market Alliance. FtMA aims to create a thriving and sustainable agricultural sector that empowers farmers, forges strong markets and improves global food security. FtMA global members – including Yara International and the UN World Food Programme (WFP) – make available their expertise, resources and country presence to build resilient value chains and improve livelihoods of farmers in Africa. FtMA forms local private- and public-sector relationships to deliver a wide range of agricultural products and services, tailored to the needs of farmers. Through a demand-led approach, the FtMA provides coordination services for farmer engagement with local agricultural ecosystem players, with the objective to sustainably improve farmer livelihoods and to develop commercial viability for all stakeholders of the agricultural value chain. The smallholder farming family is at the heart of Norwegian support to African agriculture. Norway sees the farming families as social entities as well as small businesses. The rural economy can only grow to its fullest potential when farmers realise the value of their production through fair and sustainable markets. “The opportunities presented by the Farm to Market Alliance will benefit many farming communities and presents a promising business opportunity for a growing number of farmers in the partner countries,” says Minister Astrup. About half of the 821 million people who go to bed hungry are smallholder farmers, despite their major contribution to global food production. With limited resources and basic food-storage solutions, they work small plots of land that often cannot meet their basic needs. WFP convened FtMA to help provide small-scale farmers with production and income enhancing opportunities and helps them transition to commercial agriculture. FtMA has been operational in Kenya, Rwanda, Tanzania and Zambia over the past three years and has already engaged over 140,000 farmers and over 50 local private sector actors. In Tanzania only, FtMA has already generated US$9 million in crop purchases by commercial buyers and facilitated over US$4 million worth of farmers input loans, provided by local financial institutions. The support of Norway to FtMA demonstrates that lasting change will only be achieved through systematic engagement of the private sector with smallholder farmers. Norway’s commitment provides a strong impetus for this multi-stakeholder initiative to evolve into a sustainable market model. The attendees of this event included members of the Government of Tanzania, delegates of the Norwegian Ministry of Foreign Affairs, WFP Tanzania Country Director and representatives of FtMA global members and other businesses and organizations who play a key role in the agricultural sector in Tanzania and beyond. Participants were presented practical examples of FtMA and Yara’s work, such as knowledge sharing with farmers as well as a demonstration of a soil lab installed by Yara Tanzania and joined the tour to Yara’s most modern fertilizer terminal in Africa. In 2015, 8 public and private organizations with complementing business areas – Alliance for a Green Revolution in Africa (AGRA), Bayer, Grow Africa, the International Finance Corporation (IFC), Rabobank, Syngenta, UN World Food Programme and Yara – came together to work systematically together for a common goal: to make food crop markets work better for farmers by linking them to local and regional markets. Through this partnership, the Farm to Market Alliance has successfully engaged over 140,000 farmers in Kenya, Rwanda, Tanzania, and Zambia and generated US$23 million in crop purchases by commercial buyers. Yara International ASA is the leading provider of sustainable crop nutrition solutions, supporting farmer profitability through knowledge, quality and productivity. Yara has an extensive experience working with smallholder farmers across the globe and recognizes partnerships as an important part of the solution to unlock the agricultural value chains and help increase food production, particularly in Africa. Yara provides FtMA with sustainable crop nutrition solutions adapted to farmer needs and environmental challenges, supported by knowledge of crop nutrition, water and soil, driving optimal yield, quality and productivity for farmers. Yara commits its agronomists to farmer trainings, and leverages its numerous partnerships with NGOs, governments and the private sector. The United Nations World Food Programme–saving lives in emergencies and changing lives for millions through sustainable development. WFP works in more than 80 countries around the world, feeding people caught in conflict and disasters, and laying the foundations for a better future. Building on its deep field presence, vast experience in engagement and public-private partnerships, WFP develops programmes that connect smallholder farmers to formal markets. WFP serves as the global and country-level lead on design, coordination and monitoring of FtMA operations by leveraging its supply chain expertise. WFP further acts as a catalytic buyer using its own purchasing power to incentivize other private buyers to participate and as an independent advocate, building partnerships across farmers, the private and the public sector.